Since you patiently read through the last somewhat boring bird (the Mallard) post, I figured it would be prudent to now offer the latest new bird to my collection (the one I promised at the start of the Wisconsin Birds series). With that…. 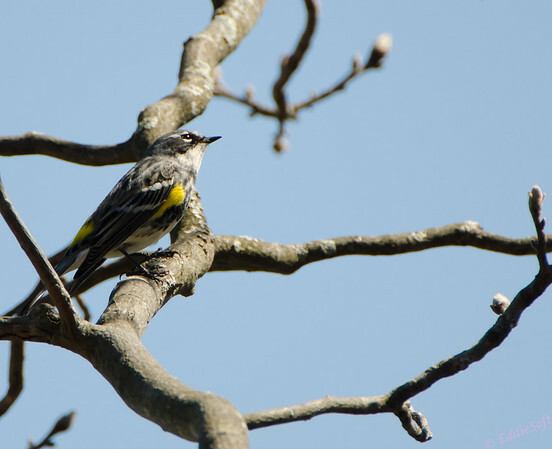 drum roll … I’d like to introduce what I believe to be the Yellow-Rumped Warbler. 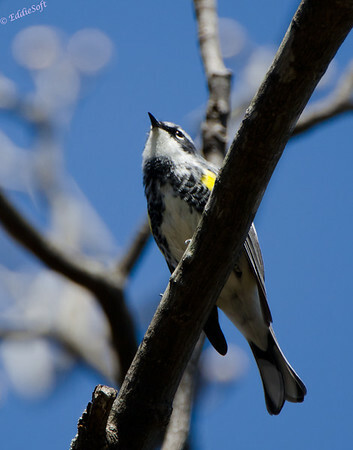 This male Warbler was shot at Devil’s Lake near Baraboo Wisconsin. As with the rest of this series it was taken over last Easter Weekend. We were actually up on the very picturesque cliffs overlooking the glacier formed lake when this bird flew over my head and landed in a nearby tree. At the time I trying my best to capture Turkey Vultures which were circling the cliffs. The frustration levels were mounting trying to get The Beast zeroed in and focused on those birds which, due to the height of the cliffs, were actually speeding by below us. 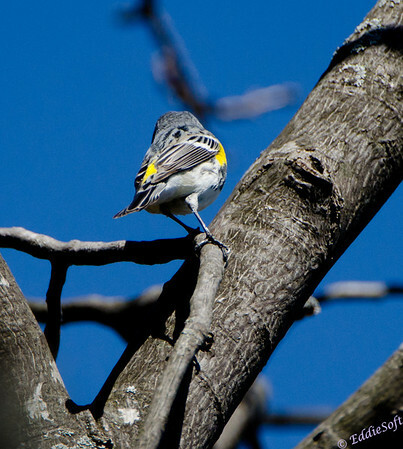 The yellow markings on this Warbler were pretty unique which caught my attention immediately. Screw the Vultures, we’ve got a new bird to track down. One thing that became painfully clear with this Warbler (and likely generalized to all of these Warblers) is it did not want to stay in one place very long at all. It would land, give me about 3 seconds to get the big glass in position, get the exposure settings right and finally take one shot. Then off it went further along the cliff trail. This cycle kept repeating until I was a long ways from Linda (who opted for a rest while taking the opportunity to once again make reference to my supposed attempts to kill her on a previous cliff trail in Acadia – not sure she is ever going to let me off the hook for that one). 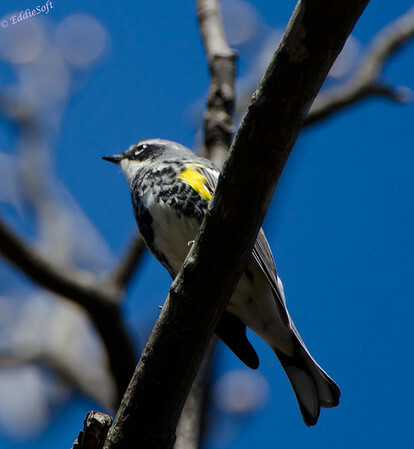 From a post treatment perspective, this is one of those birds that stands out nicely against a deep blue sky – the yellow, gray, black and white markings seem to pop a little more than the first shot which I kept at the more natural light color. I bolded insects as a reminder to myself that they were in the absolute best spot they could be in based on this staple in their diet. It is unclear whether it was a odd phenomenon based on the light winter or a common occurrence at Devil’s Lake but this place was overrun with some type of black insect. We were actually up on the cliff trail for more than just to take in the view. It was also a sanctuary from the swarm that was terrorizing the low trails on the shoreline. I am not talking about a few mosquitoes you could simply swat aside as you passed through. Nope, imagine what looked like a grey shimmer everywhere you looked. We made it half way down the trail when we gave up – somewhat based on our own experience and the rest based on the people who were busy running past us from the opposite direction babbling incoherently about a biblical plague with hysteria in their eyes. Luckily, the bugs were not biters but not a good setting for expensive camera equipment – they were all over the inside of The Beast’s hood. 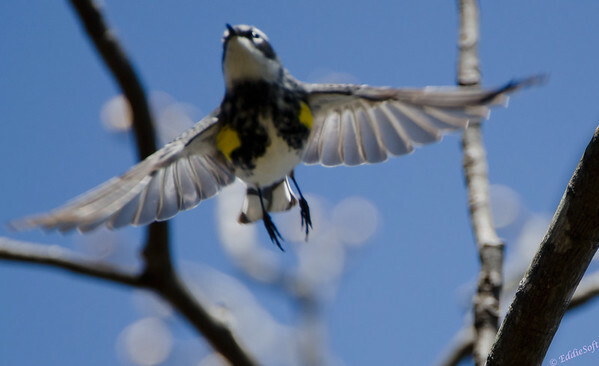 You would think these Warblers would be so fat they couldn’t fly. Here is a shot that shows the feature that led to its name. Not one of the most original titles but still better than Birdwithyellow. This was our first time out at Devil’s Lake. We have driven by it probably a hundred times over the years since our trek to Devil’s Head Ski Resort takes us right by it (we often stay in Baraboo on our ski/boarding trips up there). Other than the insects, this was a very nice park. If you go, definitely take the cliff trail – it takes some effort to navigate the trail up (and down) but once on top it is a fairly easy walk. There are number of nice outcroppings that give a view of the lake and the woodlands on top were active with birds and the standard small forest animals. In closing I decided to throw in the following shot. It isn’t tack sharp but it gives a sense of motion which captures exactly how this particular shoot went. Not only is this a good view of the breast markings, but you can even see the sunlight glowing through the delicate wings. Probably more impressive is this was done with big glass which is a struggle when hand holding through any form of bird in flight. If the focus point had just been a little closer towards the head (you can tell I locked the single focus point on its low breast/feet region) it would have been my go to fair competition shot – Linda likely sabotaged my settings to prevent me from taking honors this year in the U.B. competitions. Now time to go put another check in my birder list! Hope you enjoyed another look at the birds we shot in Wisconsin series. I like all these shots. I’ve never heard of this bird, nor to my knowledge have I seen one. The second photo with the brilliant colors might be just a bit better than the third, and the last one may not be perfect but it’s truly unique. Is the Mickey Mouse in the upper left corner of that photo? I would think the Disney Corporation would have something to say about you placing your logo on top of theirs. I’ll have to contact them. They’re a very laid-back corporation, I’m sure, and will probably say no worries, it’s just a simple old logo that anyone can use as part of their own logo. That makes me feel a little better – the reference materials were essentially calling me out as a shut-in for never seeing one. I’m with you on the second photo – lucked out with a bird with perfect complementing colors to go deep on the sky – doesn’t work so good with birds like the herons and bluejays – they tend to get lost in the sea. I guess it’s the second image rather than the third that has EddieSoft placed right on top of the “Venn Diagram,” as we like to say, wink wink nudge nudge say-no-more say-no-more. Now I have to resend all my emails–what a waste of time.